It doesn’t matter how much we love our jobs – it’s inevitable that from time to time things get a little much at work, and before we know it, we’re feeling overwhelmed and unsure of what to do next. Otherwise known as, stressed. Whether it’s workload, personal challenges or other factors – it’s bound to happen – and when we’re feeling stressed, we can’t possibly be our best selves. Quite the opposite, in fact we end up underperforming and (the dreaded word), procrastinating. So, with this in mind, isn’t it important that we consider the ways in which we deal with such stress? We believe that handling it as and when it comes, makes for better productivity, a more positive attitude and overall, a healthier well-being in the workplace. 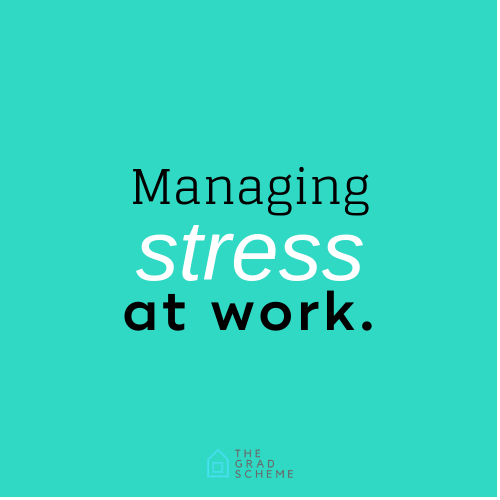 Below, we’ve popped some top tips on how we personally manage our stress levels and we hope that from reading this, you can gain some clarity on handling your own pressures. It’s a well-known fact that when we’re feeling stressed, our breathing changes. This is why it’s fundamentally important that when you’re feeling overwhelmed, you take five minutes to focus on your breathing. Focussing on something physical in the present moment allows us to come down from the experience of stress – it’s a trick to make things easier on our bodies and minds. It’s a case of literally putting yourself in a time out. No phone. No talking. Just you. Find a quieter space for yourself (maybe this is outside), and just breathe. It doesn’t even have to be a full 5 minutes, but just a couple moments to take a few deep breaths. The truth is, a couple of minutes away from your desk really isn’t going to impact your workload in a super negative way, it’s more likely to add momentum to your productivity and will reduce the amount of time you spend procrastinating! If you’d like to learn more on breathing techniques that will help you throughout your working day, here’s a helpful piece from the NHS. Stand up and walk away from your desk. Just for a couple of minutes – maybe make a cup of tea in this time or head outside, as the connection with nature can sometimes really bring you back down to earth. You must always remember that there’s life outside of the office and the external surroundings aren’t just there for the smokers! Taking a short break allows your brain to consolidate its thoughts and gives you a chance to rejuvenate. It’s a scientifically proven fact that people who take a 5/10 minute break every few hours have higher rates of productivity. If you’re feeling overwhelmed and this is causing you anxiety, perhaps the art of list writing is for you – simple but effective, it helps you organise your thoughts and allows you to prioritise your tasks. Sometimes just getting a thought out of your head and onto paper is a fabulous way to clear your mind. Remember, you can only tackle one thing at a time and breaking it down won’t make your workload seem so impossible. Heading out for a short walk may not be feasible at work – this depends on your employer of course! However, instead of taking a full 30 minutes to sit and eat your lunch, maybe try and take 20 minutes so that you can squeeze in a 10-minute walk? Walking isn’t for everyone, but it generally tends to make you feel a little more grounded and has the ability to power you up – kind of like recharging your batteries. If you’re unable to walk anywhere during your working day, try it after work. Take in your surroundings and let your mind wander too. If you’re having a stressful day, talk to someone! It doesn’t have to be about your worries, it could be a conversation steered away from what’s troubling you, but this gives your mind a little break, which could really benefit you. If it’s work-related issues, such as a heavy workload or a tricky situation, speak to someone senior. You should never feel as though you’re on your own. In our office, we believe that being happy at work is essential – after all, you spend a considerable amount of time at work. This is why we have a Health & Well-being plan in place for the team – to ensure that we are doing the best that we can do as a business to create a positive environment. Within the plan we host yoga sessions before work, which we find is a wonderful way to settle our hectic brains and get into the right frame of mind ahead of a busy day. In the summer, we offer a running club after work, to soak up a little more vitamin D! We also offer the opportunity for all members of the team to have a full subscription to the mindfulness app, Headspace, which is paid for by us. The app is easy to use and makes meditating feel less like meditating! Team members are more than welcome to head to a quiet space throughout the day and use their app, if they feel it will benefit their productivity. We encourage team members to take 5 minutes to themselves and engage their minds to allow them to come back to their happy place, if they’re feeling overwhelmed. We are lucky enough to be situated in a location where this is feasible and ‘a walk around the block’ can be a real head clearer. As a business, we acknowledge our responsibility of ensuring that our team are happy when in work – this is why we focus so hard on offering them the support they need. We recognise that looking after staff is mutually beneficial, as the better their health and well-being, the higher their performance! We’re currently recruiting for more graduates to join us as Paraplanners and Compliance Support – apply now!